Zomo presents a new professional 4 deck DJ Midi Controller - the MC-1000 with integrated 8 channel sound card! The Zomo MC-1000 controller is the perfect complement to any professional DJ set-up and acts as a comprehensive remote control for Virtual DJ as well as for Traktor Duo/Pro 2 from Native Instruments. Naturally, the Zomo MC-1000 integrates perfectly with earlier Traktor versions, as in all common MIDI-capable DJ software. A perfectly synchronized version of Virtual DJ LE as well as configuration files for Virtual DJ Pro and Traktor 2 is coming with this package. Easy Plug & Play and quick start is guaranteed. The high-quality faders and knobs and the clear layout make the MC-1000 a perfect and intuitive control of up to 4 decks as well as all the usual effects and transport functions of the software. Featuring a top of the range D/A converter device, the integrated sound card has been specially designed to offer the highest possible audio quality standards, delivering powerful bass and the clearest mid/high frequencies. 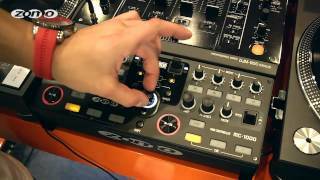 In comparison to other "All-in-One" DJ controllers on the market, the MC-1000 operates together with your DJ software like Virtual DJ or Traktor in external mode so you can continue to perform directly with the professional club mixer without having to reorganize any equipment in the DJ booth. Because of its special standard 12-inch club design format, the Zomo MC-1000 will integrate perfectly into any professional DJ setup! The optional pro mount rack offers the facility to position the Zomo MIDI-Controller MC-1000 conveniently in front of any 12-inch mixer such as Pioneer's DJM-800 so that the two units can merge perfectly into one ultimate DJ Control Centre. As usual Zomo offers a comprehensive range of accessories. Considering purchasing the Zomo MC-1000? Have questions? Ask people who've recently bought one. Do you own the Zomo MC-1000? Why not write a review based on your experience with it. Seen a video for Zomo MC-1000 online or have you own video? You will earn 198 loyalty points with this product worth £0.50, when logged in. Check out Zomo MC-1000 on DJkit.com!